If you use Facebook you might have noticed that there was a feature introduced some time ago that allowed you to tell whether someone has actually seen your chat message. This is like forcing your way since you can now bully your facebook friend for ignoring your chat notification. You see you can always tell they saw it, since it’s hard to allow the chat notification to stay up, just coz you dont want the other user to see the “seen” message just a the bottom of the chat box. And the same chat is connected to your facebook messages, so it doesn’t go away when you log off from facebook. Spooky, huh? 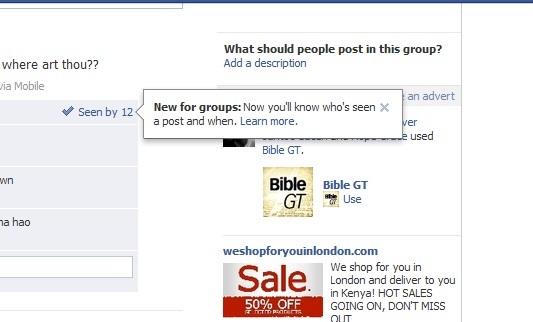 Well, here is an update that is abit positive, you can tell who has seen your post in the groups. You see a small tick on the right of every post and it indicates the number of people who have seen your post. I am not sure whether it detects once you open the group in general, click a notification or when you actually see the post but this is quite a metric to tell the reach of your communication, particularly in brand communication. It’s just like the visits in the blogs stats, only this one goes further to tell you who and who saw your post, on mousing over the tick.